Why not log on to http://dversepoets.com/ and join in with these amazing artwork prompts. 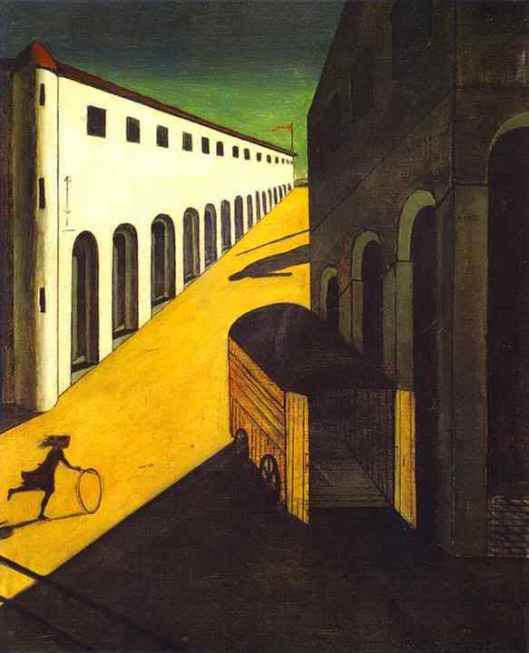 This entry was posted in Dversepoetry, melancholy, poet, poetry, poets, writer and tagged Art, Giorgio de Chirico, Melancholy, Metaphysics, poetry, Visual arts. Bookmark the permalink. thank you John – currently I am working on the principle that simple is good. I recognise your joy..stays with me.. It is odd! This picture is such a bundle of contradictions and questions. The two things that came to my mind when I saw the picture: Holocaust and Akko Prison, two separate but connected entities. Of course, it can have been about neither but an interesting resonance. Ps. I cant see what im typing as the website has gone doolally so apologies for typos! so the shadows are really deep…it certainly has a lasting impression. Do you think any joy was visible from Acco or by the holocaust victims? Maybe just a shadow, like the girl with the hoop.